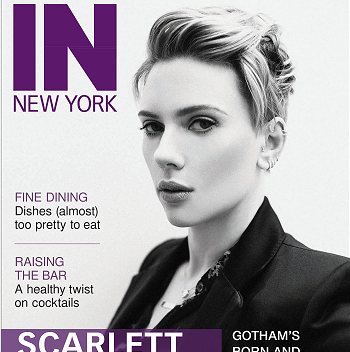 Scarlett is on the cover of W Magazine March 2015, And the outtakes from the shoot as well as the scans are now out and up in the gallery for you all as well as the story that was published. Mother, chanteuse, computer operating system, bombshell alien… ?no matter the role, Scarlett Johansson is her own woman. “When she came out of me, I was so surprised,” Scarlett Johansson told me on a cold day in December. We were at the photo shoot for this story, and Johansson, who had given birth to her daughter, Rose, just three months earlier, was wearing tight jeans and an equally snug white sweater. Her short, almost platinum hair, which would soon be covered by a Debbie Harry circa-Blondie shag wig, was slicked back. “I had a very strong picture in my mind of what my baby would look like,” Johansson continued. “And, of course, she is completely different. Perfect, but not what I’d imagined. Now, of course, I can’t picture her any other way.” Johansson smiled. As always—and I have been interviewing her regularly since her breakthrough role in 2003’s Lost in Translation—she was at once forthcoming and guarded. Johansson, who just turned 30, has been acting professionally since she was 7 and is entirely comfortable in the spotlight. (“Everyone has seen my breasts!” she said when an assistant offered her a private changing room. “I can change my top right here.”) And then, when it truly matters, she can be remarkably discreet. It was months before the public caught wind of her marriage to the French journalist Romain Dauriac. Johansson has always taken unexpected creative chances: In 2010, at the height of her movie stardom, she defied critics by acting in Arthur Miller’s A View From the Bridge on Broadway and, to the astonishment of many, winning a Tony for her performance. With the verve of a ’60s chanteuse, Johansson has recorded albums, and they are far from vanity projects. And just when she seemed a bit too art house, she took the role of Black Widow, the female superhero in The Avengers. The much-awaited sequel to that movie, Avengers: Age of Ultron (the trailer garnered 34.3 million hits in its first 24 hours online), is due in theaters on May 1. Strangely, before Jonze, no director or animator had taken such advantage of Johansson’s voice. “I actually visited Pixar, hoping that they would use me for a cartoon,” Johansson said. “They didn’t. I was ripe for the picking! What happened?” She paused. “Now they have to give me a cartoon! I just called them out.” In a non-neurotic way that is rare for an actress (or anybody for that matter), she has no fear or anxiety about venturing into new territory; she is hugely proactive.